Feeling overwhelmed with “Elul Expectations”? For some of us, the unique opportunity of Elul can slip through our fingers, as pressure mounts, and tension and expectations take their toll. 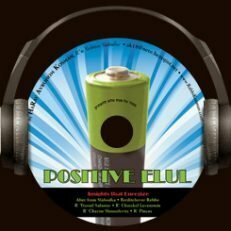 POSITIVE ELUL is a recording that can energize us to take the “baby steps” necessary, to BEGIN and actually “make it”, in these crucial times. Contains 8 Mussar presentations from Gedolai Baalai Mussar (Alter from Slabodka, R’ Chatzkel Levenstein, R’ Chaim Shmuelevitz, R’ Yisroel Salanter, R’ Pincus), carefully chosen to “lighten” up your Elul, in more ways then one (light and bright).